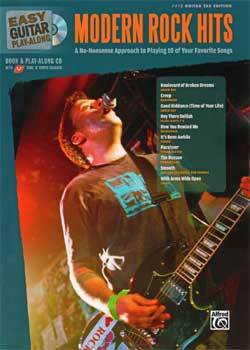 Modern Rock Hits Easy Guitar Play-Along PDF + Mp3 CD download. This book contains best popular songs from the Modern rock days and are worth learning. This book is great because it has the original rhythm and solos, it does not have all guitar parts if the song contains 3 guitar parts. It will only have the main background rhythm part and main lead part. The Easy Guitar Play-Along Series has everything you need to play your favorite songs and sound like a pro! These full-tab arrangements sound just like the artists’ recordings. Listen to the demo tracks featuring full vocals then jam with a professional studio backup band on the play-along MP3s. Plus, load the CD into your CD-ROM driver and use our TNT software to slow down tracks, loop sections for practice, easily switch between full and minus-guitar versions, and even change keys! All your favorite modern rock “off the record” guitar parts arranged to be easily playable. Includes professionally recorded play-along/demonstration tracks with vocals. Download Modern Rock Hits – Easy Guitar Play-Along PDF free and other books from our site. Only high quality PDF scans. Please write a review, it's important for our community.